These lemon cranberry scones are one of the most popular scones recipes on my entire website! The tart flavours of lemon in a sweet based scone that has zippy cranberries in it is perfection! The secret to making the best scones is my Best Scones Ever recipe, bar none. Those scones are the flakiest, most decadent buttery scones that you will ever eat. I had a thought however…..what if I made lemon scones? These are my newest version of my scones, and our favorite so far. Of course lemon makes everything better, but I had a bag of dried cranberries in my cupboard and decided to use them instead of raisins, and the scones are so flavorful it’s amazing. Mix the baking soda and the sour cream together. 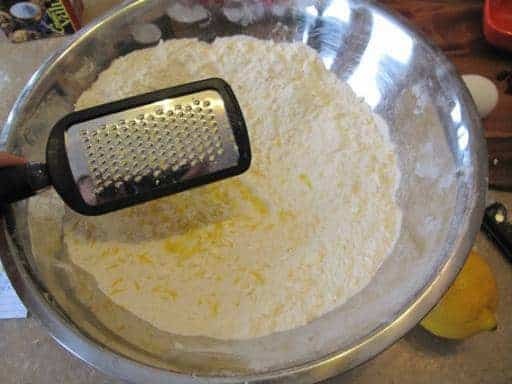 Whisk all your dry ingredients together in a large bowl. Add your butter and cut in until it’s crumbly. 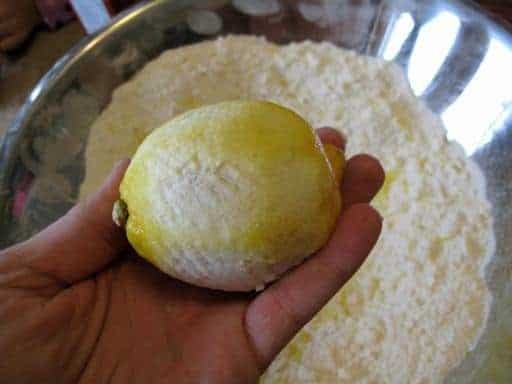 Take your lemon and grate the peel off of it into the flour mixture. It should look like this, not completely white but you got most of the peel off. Cut your lemon in half, and squeeze all the juice out, picking out the seeds that inevitably fall into it. They always do, I haven’t mastered juicing a lemon and not having all the seeds end up in the juice too. 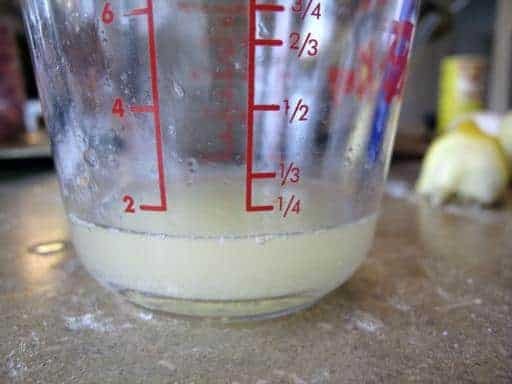 You should get around this much, almost a 1/4 cup of lemon juice. 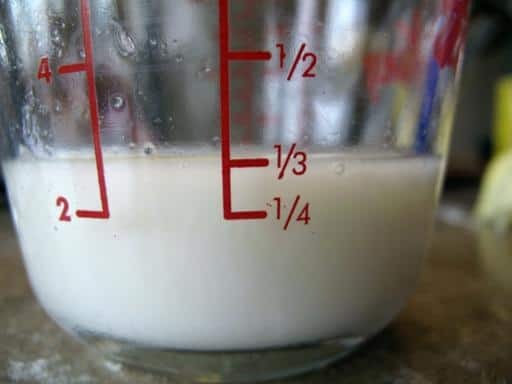 Add in enough milk to bring it to 1/3 of a cup. Don’t worry if the milk curdles. Mix the sour cream, milk and egg into the dry ingredients. 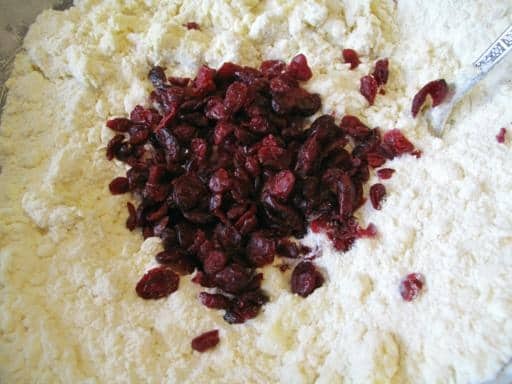 Once it’s mixed a bit, add in the cranberries. Divide into three balls, then flatten into 6 inch disks. Cut each piece into 6 triangles. Bake in a 350 degree oven and bake them until they are golden brown, from 15-20 minutes depending on your oven, and be prepared for these to be your new favorite scone! Delicious tangy lemon scones with the added zing of cranberries. Mix the baking soda and the sour cream together. Whisk all your dry ingredients together in a large bowl. 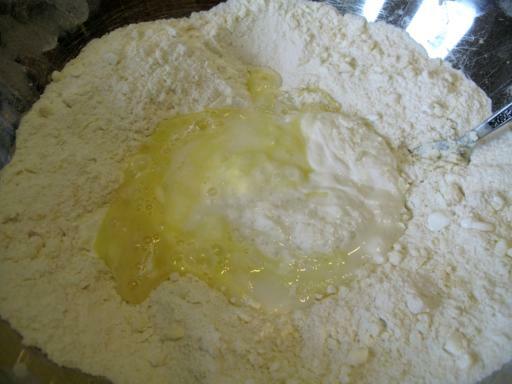 Add your butter and cut in until it's crumbly. Cut your lemon in half, and squeeze all the juice out, picking out the seeds that inevitably fall into it. They always do, I haven't mastered juicing a lemon and not having all the seeds end up in the juice too. You should get almost a 1/4 cup of lemon juice. Add in enough milk to bring it to 1/3 of a cup. Don't worry if the milk curdles. Mix the sour cream, milk and egg into the dry ingredients. Once it's mixed a bit, add in the cranberries. Divide into three balls, then flatten into 6 inch disks. Cut each piece into 6 triangles. Bake in a 350 degree oven and bake them until they are golden brown, from 15-20 minutes depending on your oven. When I squeeze lemons, where possible, I use a loose tea strainer-the kind you can lay over a tea cup. 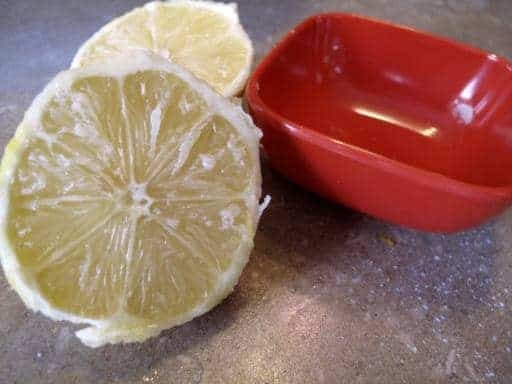 I grate the lemon first for the rind, then I roll that lemon, or lemons lightly on the counter so the juice comes out more easily, cut it in half, then squeeze it over the strainer into the measuring cup or just a cup. I know that I can go through chasing the pits with a fork and getting rid of them that way, but this is easier and generally works well. Hope this helps.. PS. My husband has “offered” to be the cleaner- upper -when I bake these scones! I am going to try these asap, they look & “sound” wonderful. I have never made scones before, hope I can do it. Wonderful scones! I used 3/4 cup of sugar in the dough and then brushed the scones with milk and sprinkled sugar over the top before I baked them. Delicious! Glad that you liked them!! Ah yes, summer, when we have to bake in the morning so we don’t heat up the house! A cool morning so I made some more. I will make these this week! That detailed recipe shows me exactly what to do! Yummy, now if I could only Bake! Amen a dream come true lol. 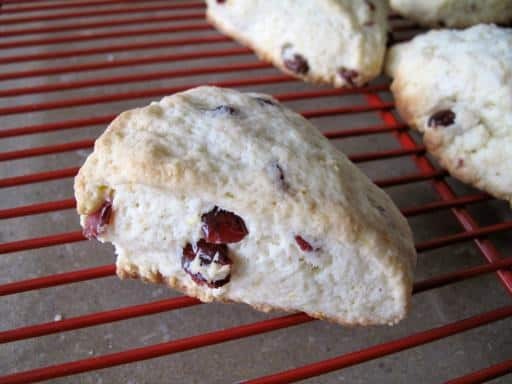 These are one of my favorite scones recipes ever. VERY tart and delicious! These are truly the best !!! ***** I have made them & I am making these this week and taking some for my hair dresser , she is big scone lover. Looks delicious , must try !!! These are AMAZING scones. One of my favourite flavour combo’s! Give it a whirl! I have orange/chocolate on my To-Try list! Yes made those too ! Amazing! I made those last weekend and they were really good. I’ve made this at least 20 times now. It’s really awesome. Somewhere along the way, I started using yoghurt, and then I accidentally left out the egg, and it seemed to taste even better. So my humble suggestion is to leave out the egg and double the sour cream (yoghurt in my case). I also like to use a simple icing sugar/water glaze after they’ve nearly cooled. They taste exactly like the Starbucks lemon cranberry scones this way. Yummers! 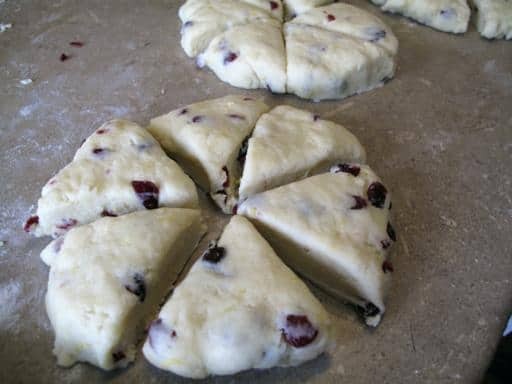 I got on to lemon/cranberry scones a few weekends ago and have been baking up a storm trying to find the perfect batch since. Your recipe is by far the BEST and I have tried many (including one from a well known “Food Network Host”). As with most people who know their way around a kitchen it is hard to not “tweak” a recipe. With yours I only added 3/4 of sugar, added 1.5 tsp of vanilla and with a recipe as great as this one is, you just have to use whole fresh cranberries!! That tangy zing when they pop in your mouth as you bite is to this scone is out of this world!! (I also added extra lemon by grating a full lemon and a half) as well, I made sure I had a healthy 1/4 cup of juice. I also did up a lemon glaze (1 cup of icing sifted icing sugar adding enough lemon juice to achieve optimum drizzleness). I only glaze half of my scones as yours do not need it, was just nice to be able to offer both to my family and guests. I will be trying your buttercream recipe next!! I’m going to have to try these. I was wanting to find a scone recipe to try! Hey. I have no sour cream inthe house. Would it work if i used plain balkan style yogurt? Hmm, if it has the same chemical reaction with the baking soda, I don’t see why not? I used yogurt in strawberry scones and it was fantastic tasting! Hey. I have no sour crema inthe house. Would it work if i used plain balkan style yogurt? Great Scones! I made them with whole wheat flour and it work just as well and tastes just as good if not better! oh my god!!! i just made some lemon cranberry scones and they were the best i have ever had!!!! i am going to shair it with everyone! These look great! Will have to try them soon.